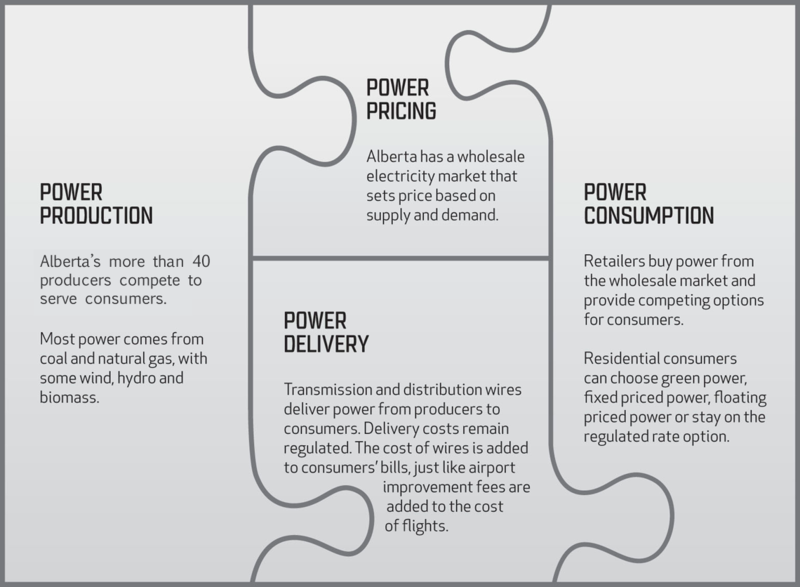 In Alberta's power industry, the price of power is determined through competition. The delivery of power, via transmission and distribution wires, remains regulated. Wholesale prices rise when supply is tight, for example when power plants trip off-line. Wholesale prices fall when supply is abundant, often when the wind powers wind farms. Because power plants are now at investor risk, developers are driven to build the most efficient plants they can. That efficiency results in lower prices for consumers. Transmission is required to deliver power to consumers and to connect supply that wants to compete. The more supply that is available to a market, the greater the depth of competition and the greater the downward pressure on prices for consumers. Alberta's residential costs for power (energy and wires) were not far off other Canadian provinces in 2009. Even with future supply and transmission factored in, Alberta is competitive with other provinces. Keep in mind that Alberta faces growth greater than any other province, it does not subsidize the cost of power and Alberta relies on coal and gas for its power, not lower cost hydro. The 2016 wholesale price of electricity has averaged 1.7 ¢ kilowatt hour (kWh). This is well below the cost of building new coal, wind and most natural gas-fired generation plants. When price is below replacement cost, consumers benefit. Competing generators have added over 8000 megawatts (MW) of new supply from 2001 to 2016, which is almost twice the size of SaskPower's entire generating capacity. From 2001 to 2015 Alberta's power supply increased by 50 per cent, yet wholesale prices fell by 52%. The competitive market has brought cleaner power supplies to the province. Most of Alberta's new supply is natural gas-fired. Alberta also now has 1445 MW of wind generation, one of the highest concentration of wind power in Canada. And none of Alberta's new generation is subsidized by Alberta taxpayers. Electricity is complicated. Would an analogy help? Power producers are like airlines. They compete against each other to serve customers. If they are inefficient, they go out of business. Transmission and distribution wires are like runways. We build one terminal and one set of runways and allow different airlines to use them. Electricity wires carry power from competing producers to consumers. Wires are centrally planned, just like airport expansions are determined by local airport authorities. Airport expansion plans are charged to passengers on their tickets, just like transmission expansions are charged to consumers. Why did we restructure our power market in the first place? To take advantage of new, smaller scale generation technology. In the 1990s, power plant technology changed. No longer were plants large, cost intensive assets. Wind power and gas plants were scalable, meaning companies of all sizes were prepared to build plants and compete. To shift investment risk to developers and away from consumers. In regulated markets, consumers bear the risk of investments. For example, Ontario consumers shared $40 billion in debt associated with costly nuclear power plants. In open markets, this investor risk drives efficiency, which drives a downward pressure on market prices. To introduce competition in price. Generation is the expensive part of any power system. Open markets bring downward pressure on price through competition. Open markets encourage innovation as competitors seek to earn new customers. New products such as long-term contracts, green power or on-site power are examples of this innovation.